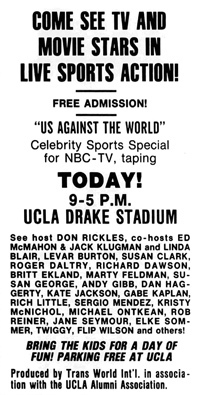 Rod Taylor participated in NBC's "trash sports" rival to the "Battle of the Network Stars" franchise on ABC. The action was filmed Sunday, Aug. 28, 1977, on the UCLA campus and aired Sept. 7, 1977, as a two-hour TV special. At this time, NBC was promoting Rod in his new show "The Oregon Trail," which would premiere later in the month. Three teams of five men and three women represented their native lands, competing on behalf of the United States, the United Kingdom and "the rest of the world." They competed in events that included rowing, swimming, relay running, bowling, soccer goal kicking, volleyball, darts, pinball, tug-o-war, and a sled pull in which team members compete in a distance pull of a huge steel globe. A three-horse thoroughbred race was also conducted for the special, featuring three of the world's leading jockeys: Bill Shoemaker, Laffit Pincay and Angel Cordero Jr.
An article that appeared prior to the taping of the competition listed the sports as tennis doubles, swimming relay, bowling, running relay, obstacle course relay, rowing relay, soccer goal kicking and golf. The preview also said the jockeys would be Steve Cauthen, Bill Shoemaker and Laffit Pincay. 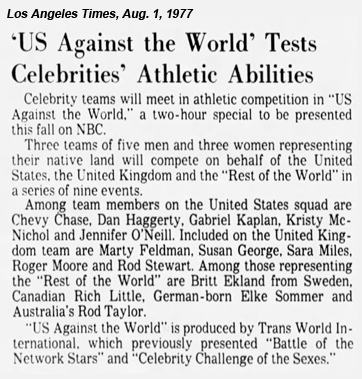 The U.S. squad included Linda Blair, Chevy Chase, Dan Haggerty, Kate Jackson, Gabriel Kaplan, Kristy McNichol, Jennifer O'Neill, Rob Reiner, David Soul and Flip Wilson. The U.K. team had Roger Daltrey, Richard Dawson, Marty Feldman, Susan George, Andy Gibb, Sara Miles, Roger Moore, Rod Stewart and Twiggy. Rod represented Australia on the "rest of the world" team, which also had Canadians Susan Clark, Rich Little (captain), Michael Ontkean; German-born Levar Burton and Elke Sommer; Sergio Mendes of Brazil; and Britt Ekland of Sweden. Don Rickles, Ed McMahon and Jack Klugman provided hosting and announcing duties.